Each round a few goods will arrive at some of the 5 stores. 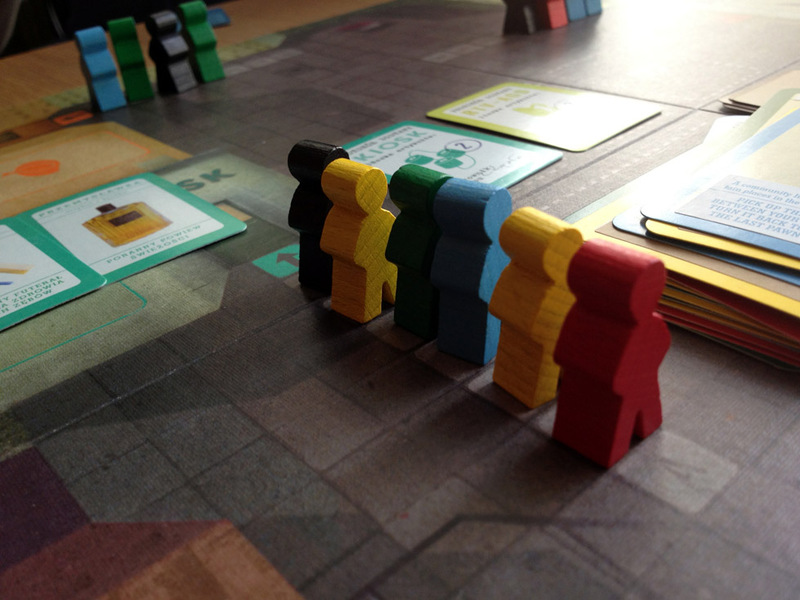 First, before knowing what will arrive where, players take turns adding any of their people (meeple) who are not in queues to the queues. Then, goods cards are revealed which determine how many goods arrive at which stores, e.g. 2 electrical items at the electrical store, 3 foods at the food store, etc. Next, each player draws 3 cards from their deck and then take turns playing cards. The cards allow players to manipulate the queues; for example, ‘a friend lends you a baby’ allows you to move one of your queuers to the front of the queue they are in. Other cards let you move other players backwards, reverse an entire queue, move a good from one store to another, close a store for one round, etc. Playing cards is a tense game of trying not to make too many enemies and trying not to show your intentions too early. There are several factors that make this even more interesting. First, each player only has 10 cards in their deck to last them 5 rounds (Monday to Friday), so using 3 cards in one round means having fewer than 2 cards in a later round. Second, if you pass, you can not play any more cards that round, so sometimes you play cards just to stay involved so you can react to any further changes other players make to the queues. Third, any unused cards go back to the top of your deck so you know what you’ll get next round, but sometimes you also know you want to use the card so next round you don’t get the same card. Once everyone has passed, card playing ends and the meeple at the front of queues at open shops with goods take 1 good each until the goods are gone. 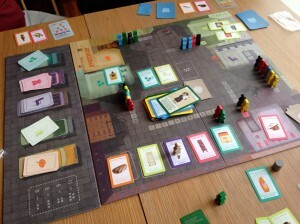 Just before the round ends, players queued at the market (separate to the shops) can exchange goods they have for those available – so any surplus goods you gain can still be useful; however, it’s an expensive process as you usually need to spend 2 goods to gain 1 other good (if it’s available). That’s me (red) at the back. I reversed the queue (hurrah). Then someone closed the store (crap). Overall, Kolejka is a superb Eurogame with very tight resources – every card and item is important and there’s lots of interaction (humorous rather than aggressive). However, the key that makes it a good game is that almost every choice is interestingly difficult as you work out how to make the best out of your cards and react to what others play too. Not only are the goods very limited, you get few cards each round too and even then you don’t have enough cards to play all 3 every round. As everyone wants the same goods, competition over every item is high. Each card played can make a big difference so avoiding passing can be very important but must be balanced with using the card to do so. The theme fits perfectly and feels a solid part of the game, not simply pasted on; plus, the theme is very different too. The game was created by Poland’s Institute of National Remembrance to ensure people do not forget the events of the 80’s and the rule book also includes a history of the real events. So, the Institute has not only achieved their goal, but have created a fine game that would stand-up on its own too. The only downside (which is minor) is that whilst the game comes with multiple rulebooks (one for each language), there is one set of cards printed in Polish. Each rulebook has two sheets of stickers which you need to carefully stick onto the cards, over the title and description, to convert the deck to your language. As there are 100 stickers, it takes quite a while, is quite fiddly, plus it takes a while to work out which sticker goes where (and you don’t want to make any mistakes). It’s an interesting way to save cost and, once done, is not a problem (just be careful when shuffling so the stickers don’t catch on other cards). So, this is not a problem – just something that’s a bit different. In the end, I hope Kolejka gets good distribution via Rebel.pl. It is an excellent Eurogame with lots of interaction, tight and tense play, and a fitting and unique theme. P.S. One of the humorous ironies at Spiel was that my friend that bought this got the last one on the stand (taking the display copy as they had run out that day). Then, in a further, fitting twist, I bought a copy the next day as they had fresh stock. 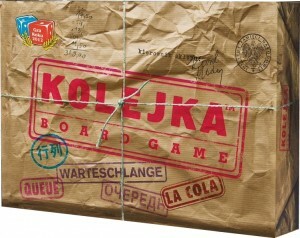 This entry was posted on Tuesday, November 6th, 2012 at 6:02 pm	and is filed under Board Game Review, Board Games, Essen Spiel 12, Kolejka (Queue). You can follow any responses to this entry through the RSS 2.0 feed. You can leave a response, or trackback from your own site.